Why call it a “Coaching Camp”? Training camps are about getting away from everyday life to do a big block of riding in a condensed period of time. The intended result is a significant (but temporary) over-reach that after a period of rest allows the magic of super-compensation to work, resulting in increased fitness. A coaching camp gives you this and so much more. There is a very real focus on developing skills as well as multiple opportunities to learn how to perform better in your target events. Through learning, practicing and refining key skills on the bike, and participating in state-of-the-art evening presentations on preparing for and competing in amateur sportives and GranFondos, you will make far more progress than in a typical training camp. And yes, there is still a big block of riding! Each day has its own coaching focus, beginning with a technical presentation the night before. The coaches ride with each person for parts of every ride and make substantial use of on-bike video to provide feedback. With the exception of a 10’ test on Day One, the camp is designed on the polarised principle, with all rides in Zone 1 or 2. This “long slow distance” approach has been shown to be more effective than encouraging riders to train at “sweet-spot” or threshold when their target events are still several months away. The shortest daily ride was 60km and 1300m+. The longest was 115km and 2800m+. The coaches are always ready to do more than anyone who so desires. Read on for a day-by-day description of how we coached each of these themes. We were looking at the riders’ general level and especially their position on the bike and their skills in bike-handling, anticipation and road safety, braking, cornering, climbing, descending, standing on the pedals, drinking & eating while riding. The first part of the ride was 10km of flat riding as a warm-up. We were attentive to a progressive warm-up at moderate and then higher cadences, including a few spin-outs while keeping the intensity low. We could also see immediately if anyone was badly positioned on their bike or seriously deficient in any of the core skills (happily not). On the first climb (8km, 7%) we asked each rider to make a 10’ hard effort, and filmed their pedalling technique while they were doing it. This was a great opportunity to identify poor technique. After the 10’ effort the ride was intended to be in Zone 2 (below LT1, the first lactate threshold). Needless to say, we coaches spent more time encouraging people to slow down than to speed up! After a total climb of 19km (1000m) we made a short descent and stopped at our favourite café in Santiago del Teide. Coaching points were exchanged before the short, steep climb and then very steep descent to Masca. This is not a road for practicing descending: the turns are tight and the tourist traffic is unfortunately heavy, but it brings us through some amazing scenery to much better roads the other side. The final 11km descent after climbing out from Masca is on a wide, open road which is ideal for descending practice and gave us the first opportunity to use the video. The total ride was 66km and we climbed 1,800m, getting back to the hotel at 13h30. After a buffet lunch, the afternoon was spent on massage, stretching class and one-on-one debriefs with the coaching team. The evening technical session was focused on descending skills, the theme for the next day. Descending is perhaps THE most important skill in the mountains, and impossible to practice anywhere else. It is always a major focus during our coaching camps. Our first objective is safety; our second objective is technique. Only once these two are well-integrated can we talk about speed. We chose a section of road with 8 different corners of varying difficulty in quick succession. Each rider descended this multiple times and was filmed multiple times. While some chose to cycle up each time, others took advantage of the van to cut down the physical effort required. As is often the case with intermediate-advanced riders, the biggest errors were in poor choice of line through the corner: not entering wide enough, cutting across too early and drifting too wide on the exit. Once these mistakes were corrected we could start to focus on going a little faster, tightening the turn by pressure on the inside arm and even counter-steering to set up the entry to the turn. We finished the ride by visiting the lighthouse on the far NW tip of the island. This is a stunning road carved into a cliff face with amazing views across the banana plantations and the deep blue sea. The total ride was around 55km with 1000-1300m of climbing. We were back at the hotel at 13h30. The evening technical session was on climbing, pedalling skills and pacing. We used a turbo trainer with a volunteer to demonstrate in front of the group. The key learning point for many was how to fully engage the glutes, which are the strongest muscle in your body but frequently under-used in cycling. If descending is perhaps THE most important skill in the mountains, climbing is obviously the second most important. While it may seem at first sight to be purely a question of strength and fitness, there is in fact a considerable amount of skill involved in climbing efficiently, making the most of the available energy. We discussed these points during the technical session the previous evening, so that all were ready to practice on Day Three. We began the ride with a 10km warm-up on the flat, before turning off and climbing to Masca from Buenavista. The initial part of the climb is 10km, rising 640m at an average gradient of 6.4%. This is a great road to pick up a rhythm and make steady progress. From the lookout point at El Baracan the route is more technical, culminating with the challenging 4km climb from Masca, at an average of 11.5%. This is a tough climb with frequent pitches at 15% or more. Few amateur riders are able to spin comfortably up this, which requires using the easiest gear available and frequently standing up. One of the key tips on steep climbs like this is to push your heels down and keep them down even over the top of the pedal stroke. This change in pedalling style engages the glutes and makes it easier to put a high force on the pedals while the cadence is low. A second tip for endurance climbing is to stand more often, gently rocking the bike from left to right with open hands. You should be standing up as straight as possible to put your full body weight on the down stroke. Cadence should be lower than when seated, so if you stand up on a constant gradient you should change gear 2-3 times to bring the cadence right down to around 50rpm. Done right standing feels like a rest and your heart rate will remain the same or even decrease. The total ride was 65km and 1,800m. We were back at the hotel at 2pm. Pacing is a crucial skill for riding GranFondos or sportives in the mountains; even more so at multi-day events such as the Haute Route. Time and gain we see people make the same mistake: starting out too quickly, they are unable to maintain the pace and finish much later than they might. Pacing has also important application in training: following the principles of polarisation, if you make your everyday training rides too hard you will be unable to do the very hard interval sessions that will improve your performance. The key is to ride in Zone 1 or Zone 2 (technically below the first lactate threshold, LT1, the point at which the concentration of lactate in your blood starts to rise). This feels ridiculously easy at first, although you will soon find it is not easy to maintain for 5 to 6 hours. How do you know you are in the right zone? Conversation is easy and the pace feels sustainable for several hours. If you have a power meter the average power should as stable as possible and less than 75% of your FTP. Your heart rate should also be quite stable in Z2, at or less than 88% of your threshold heart rate (the rate observed when you make a maximal effort for 40-60 minutes). Day 4 is particularly well suited to a focus on coaching because it is a long ride including two long climbs; first from Garachico to Santiago del Teide (20 km, 1,100 m+) and then from Tamaimo to El Teide (30 km, 1,400 m+), finishing with the long descent to Granadilla. The total ride was 94 km and 2,800 m. We arrived at our new base in Granadilla at 3.30. Lunch was waiting for us! As one might expect the use of power has been a constant theme throughout the week. We have highlighted its use in pacing, in training design (matching training to the demands of target events), in measuring and increasing one’s fitness and physical limits, and in planning peaks of form to coincide with key objectives. In the technical session on the evening of Day Four, Bryan Taylor, CEO of InfoCranks, revisited these themes and shared his insights from his daily work with the UCI, national federations and the coaches to Olympic athletes and World Tour cyclists. The bottom line: power is becoming more and more important in the quest for peak performance, putting an ever-higher premium on precision and accuracy. The blanket claims of +/-2% accuracy made by power meter manufacturers do not stand up to scrutiny: buyer beware. Today’s ride was the massive climb from sea-level at Los Cristianos to the cable car station on Mt Teide. It was the ideal ride to put into practice all the key points from the week so far: climbing technique, pacing, nutrition and hydration, descending. As usual, the coaches made sure to ride with each person in turn throughout the day to provide friendly reminders and tips. The total ride was 111 km, with 2,750m climbed. We were passed by several pro riders on the climb, amongst them Primož Roglič training hard! After coffee and snacks on the terrace of the hotel Parador, where the professional teams generally stay to benefit from the altitude, we were back at our hotel in Granadilla for a late lunch at 3:30. Of course we did not wait until Day Six before talking about the importance of nutrition in endurance cycling, however it was the focus of the technical session the previous evening. In particular we discussed general nutritional requirements for athletes at different times of the year, including the controversial issue of supplements. (Our view on this: ignore the marketing and avoid all supplements that are not specifically recommended by your own doctor). We looked at nutrition before, during and after major competitions and the emerging science around nutrition periodisation. The ride was in two parts: first a 50 km roller-coaster up and down, round and about on the beautiful road heading NE from Granadilla in the direction of Santa Cruz, and then a long climb up Mt Teide from the eastern side, starting in Guimar. Some of the group opted to stop the climb after a very respectable 21km and 1,600m, descending to a pick-up point in the north; a few intrepid souls continued to the top of the mountain once more and then descended all the way to our destination near La Orotava. Today’s destination was a highpoint of the week: the family home of Alberto and Marcos Delgado from our partner Tenerife Bike Training, where their Mama treated us to a traditional Canary Islands lunch. The hospitality is legendary and we spend all week looking forward to this moment! The ride was 88km and 2,000m of climbing (or 115km and 2,800m for those who went to the top). The coaching camp concluded that evening with a final technical session focused on tips for riding mountain sportives, such as the Marmotte, the Tour du Mont Blanc and the Haute Route. 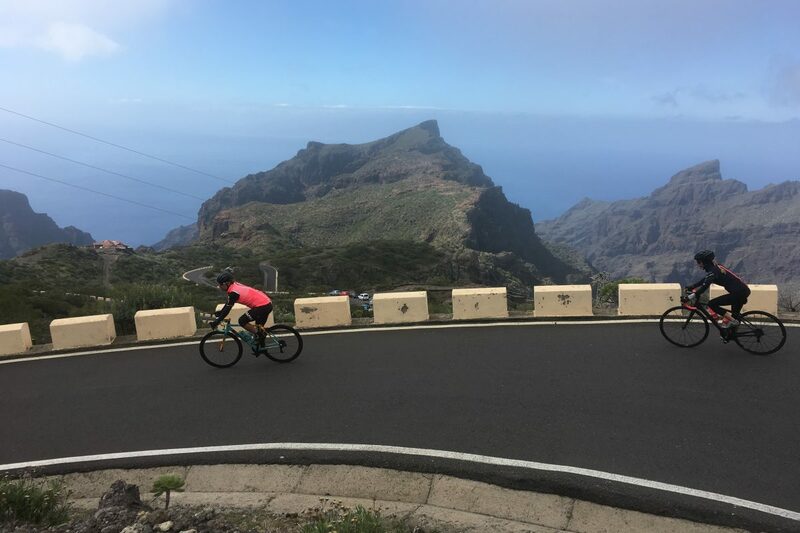 The 2019 Alpine Cols Tenerife coaching camp was held from 2-9 February. The camp is run as a partnership between Alpine Cols and Tenerife Bike Training, with the latter providing local guides and logistical support while the former focuses on coaching. Apart from the coaching discussed above, an important feature of this coaching camp is the choice of small independent hotels. Converted from traditional Canary Island homes, the hotels we use are not only charming places to stay but also give us access to parts of the island that are rarely seen by visiting cyclists. This clearly distinguishes our coaching camp from the training camps offered directly by Tenerife Bike Training as well as other providers, all of whom use the large tourist hotels in the Los Cristianos area. These hotels are very popular with groups of mostly retired holiday-makers out for the winter sun, and the cyclists form a very small group amongst the hundreds queuing at the buffet! “My week with Alpine Cols in Tenerife exceeded my expectations. In particular I have learnt how to descend safer and faster (a key objective for me on the trip). Over the week I noticed a marked improvement In 4 distinct descending techniques, as well as areas to continue to work on. I believe will lead to me being able to race with faster groups downhill, as well as corner faster on road races. The individual coaching over the week, particularly from Silas one of the coaches also improved my climbing (on and off the saddle). Surprising I think some improved power with some improved stretching after the ride and pedal technique in specific circumstances. The practical nutrition advice which should reduce the amount of low energy time in the events. The level of support was incredible with 6 guides/coaches for 9 of us. Hotels were traditional and excellent, with plenty of thought and planning put into the nutrition (e.g. lunch also available immediately after the ride, and good nutrition choices for all three meals). “Many thanks for an informative and supremely well organised trip. During the camp, the practical coaching surpassed my expectations. Silas is an exceptional coach who not only is a fount of all cycling knowledge & generally super guy but was also very encouraging. I’d not come across his practical pedalling tips anywhere before despite reading quite a lot on the subject. And these were tips that one could apply straight away & see a measurable difference immediately – sometimes substantial. “I thought the camp was excellent. Organisation was great, coaching very good and informative, and all carried out & delivered in a fun way. “Lots of potential” for me to improve, as Silas said! Support from Tenerife Bike Training guys very good, as well.